I will admit that this is one of my favorite artworks I have ever done. There's just something about it that seems to speak to me. I think I relate to it... perhaps it's even a self portrait? 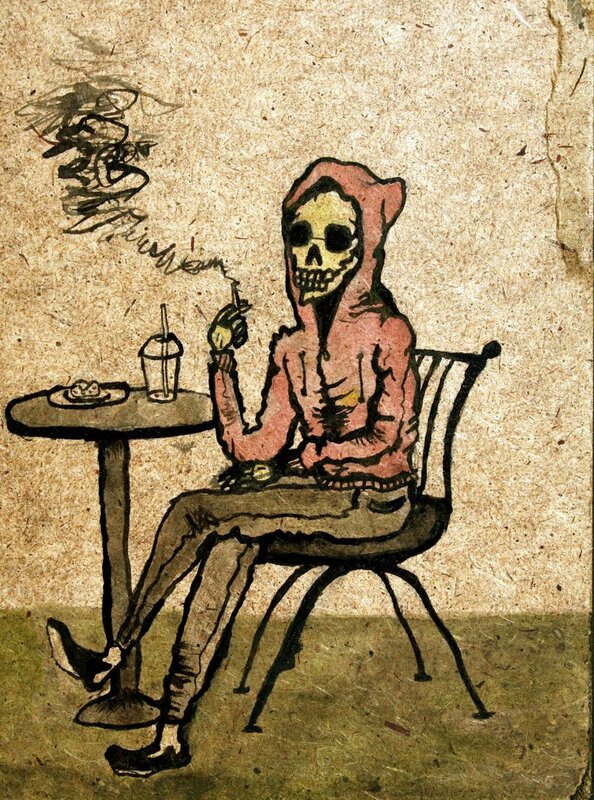 When I designed it I imagined an trendy "modern kid" lurking in his favorite indie coffee shop, doing what they do best ( which is drinking over priced lattes and chain smoking). And of course since this guy is malnourished and "dead inside," I made him a skeleton. The lines were done with india ink, and I believe the browns and red are watercolor pigment. The whole thing was done on a tiny piece of scrapped wood that was likely a piece of a cabinet or furniture at one point. I guess this is a "successful" piece because it was stolen from me shortly after it was created. Naively, I allowed it to be displayed on the wall during a school function, and the day after that it was gone. Whoever has the original, I hope you're enjoying it! The funny thing is, I probably would've made them something equally as good and free of charge just so that they wouldn't have taken this piece. 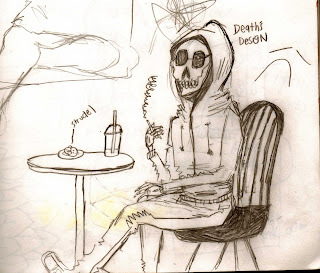 The concept sketch behind the coffee shop skeleton. Even so, I still wonder about who has the original. I would love to meet this person. I'm not even mad, I take it as a compliment! I just wanna know what happened to it, where did it end up? Is it in a college dorm room now? Was it a gift to an ironic hipster who has it hanging on the wall in his living room? Is it in the city dump? One day I hope this person is brave enough to step forward and admit that they liked my work so much they stole it straight off a wall. I would be tickled pink. This piece was also featured in my post about getting art supplies on a budget because of my awesome scrapped wood find. High resolution 8 1/2 x 11" glossy prints are available. Contact me for more details if you'd like a larger size.